Maldives is an independent country made up of over 1190 tiny coral islands scattered in the Indian Ocean. The country is among the world's oldest. It remains unknown exactly when Maldives became populated, but is is believed the first settlers came around 300 BC, most probably fishermen from neighbouring Indian subcontinent and Sri Lanka and later Arabs and Africans. It is not known exactly when settlers came to the Maldives, but historical clues indicate Maldives have been populated well over 2500 years. Earliest written history can be traced back to 500 BC when a Srilankan Prince named Vijaya and several other people set sail in ships, to travel from Srilanka to India or the other way around. They went adrift and arrived Mahiladvipika (Maldives). 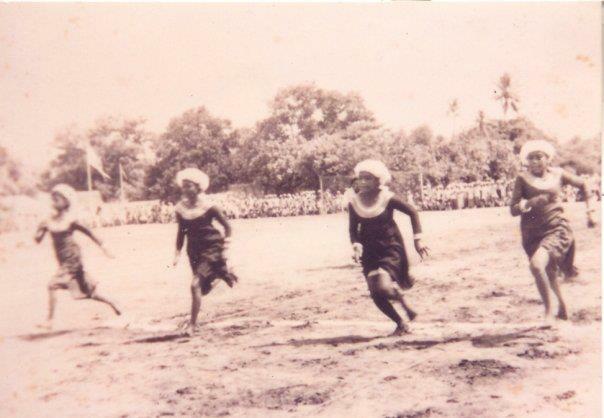 It is said that the people from Mahiladvipika (Maldives) used to travel to Srilankan even at that time. 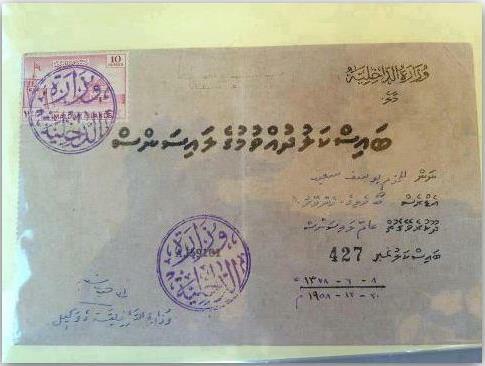 This indicates the people of Maldives were well settled in 500 BC. Despite its smallness in land area and population the Maldives not just maintained diplomatic relations with many countries but also exchanged gifts, sent delegations and followed a streamlined protocol of governance. Claudius Ptolemy, a Greco-Roman historian and astronomer refers to Maldives in his book "Geography of Claudius Ptolemy" which was originally titled "Geographia" written in second century. Ammianus Marcellinus, a Roman soldier and historian mentions in his "A Fourth Century Notice" that a delegation from Maldives visited Rome, bearing gifts to Emperor Julian in 362 AD. A historical Chinese document records that the King of the Maldives sent gifts to the Chinese Emperor Kao-Tsung of Tang Dynasty in 658 and 662 AD. "The inhabitants of the Maldives all Muslim, pious and upright, sound in belief and sincere in thought; their bodies are weak, they are unused to fighting and their armour is prayer. The Indian pirates do not raid or molest them as they have learned from experience that anyone who seizes anything from them speedily meets misfortune. In each island there are beautiful mosques, and most of the their buildings are made of wood. They are very clean and avoid filth; most of them bathe twice a day to cleanse themselves because of the extreme heat there and their profuse perspiration. They make plentiful use of perfumed oils, such as oil of sandalwood." When Maldives sent gifts to China in 658 and 662 AD the king was named Balaadeettiya. There were other rulers before and after him, but the periods are not known. King Mahaabarana Adeettiya (official royal name: Koimala Siri Mahaabarana Mahaa Radun) was the first to rule over whole Maldives and Minicoy which is now a part of India, he ruled from 1117 to 1141. 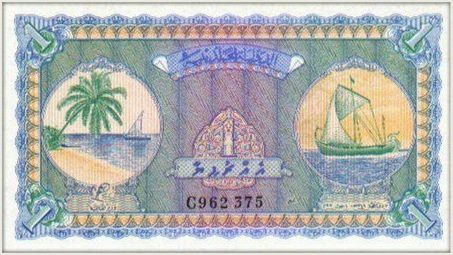 Hagubeykalun the first known reference to the Maldivian defenders dates back prior to the reign of Sultan Al-Gazi Mohamed Thakurufaan who ruled between 1573 to 1585. There three bearers of high office designated as Maafaiy, Faamuladheyri, and Dhaharaadha were responsible for organising the security of the country. During Sultan Ibrahim Nooraddeen Iskandhar's brief reign, he enlisted selected youths and trained them with some marshal art tactics who then took part in royal ceremonies. On 21st April 1892 a royal degree was signed and new security force was established. The king was the Commander-In-Chief the new force was authorised to carry arms. That forced was continued under different names and now it is the Maldives National Defence Force. The Military today spends an estimated budget of $45m per year. 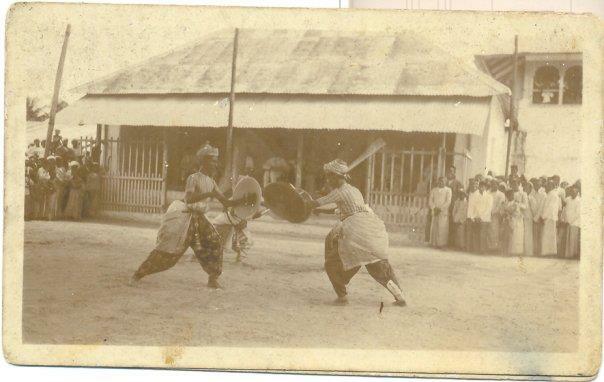 Historical evidence suggest the country was ruled with strict laws and regulations. It is widely known that wearing slippers or shoes was banned for ordinary citizens. Ownership of radios and riding bicycles were permitted under a license, bicycle lights were given a separate license, probably because riding bikes at night was banned for ordinary citizens. 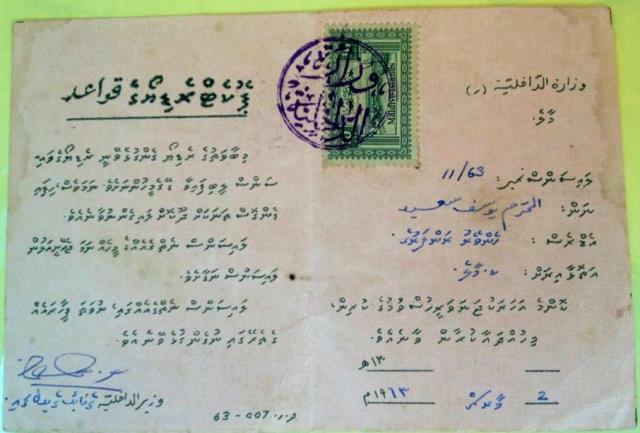 These licenses came with seal of government authority while the bike licenses even needed revenue stamp on it. Photo: a pocket radio license issued in 1963. It says only the people at licensed house are allowed to use this radio and it should not be taken to other houses or shops. 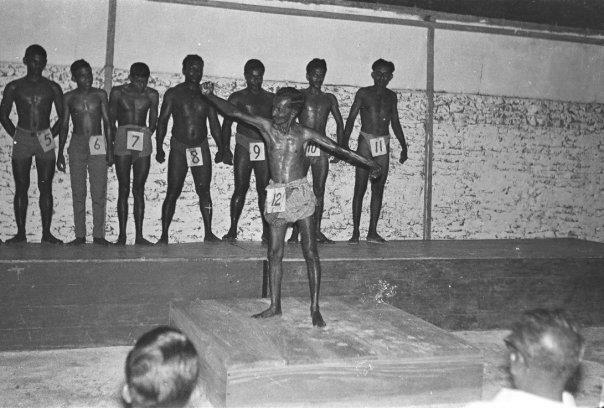 Laws and rules got strict as dates folded back, and governance remained strong through out Maldives history, except the times of foreign invasion. P.S: Many languages have its own word for Maldives such as Dhivehi Raajje (in local language Dhivehi), Maledives, Maledivy, Malediven, Maldivene, Mahaldeebiyya (ancient Arabic), Mardaifu (pronounced by Chinese). In the ancient history the names were even more.